While “My Boat’s on Fire” may sound like a great line from a sad country song, this is NOT our Sea Song of the Week. After mentioning several incidents over the past few weeks involving boats on fire (e.g., here, here and here), we realized this happens more often than you might think. 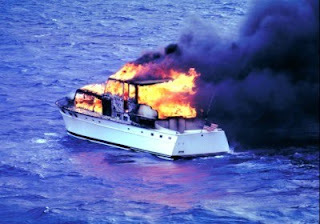 According to Seaworthy Magazine, more than half of boat fires are caused by electrical wiring faults - battery cables, bilge pump wires, instrument wires, shore power cables and appliances. About a quarter of boat fires start from an overheating engine, and just under 10% of fires are the result of a fuel leak. Now what can you do about it? Vincent Pica, a District Captain in the United States Coast Guard Auxiliary, runs the Atlantic Maritime Academy. 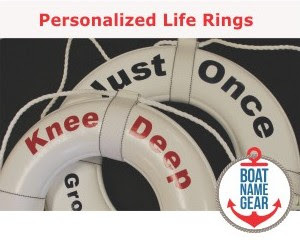 Pica suggests that boaters should be prepared by at least having the required fire extinguishers onboard, and to make sure that they are located in convenient places, using common sense. They should be kept where they are easily accessible as well as in the sleeping berths in case you need to fight your way through a fire at night. Pica’s website also has tips for what to do if a fire does break out on board, and lists the required fire extinguishers based on boat size. As a member of US Coast Guard Forces charged with protecting boaters, Pica knows first hand that fires onboard can be dangerous business. On boat fires in general, Pica stated, "What could be more frightening than fighting a fire on an ever-decreasing amount of boat and then leaving into a hostile environment - the sea?" For more info, visit AtlanticMaritimeAcademy.com. All power boats, except outboards, less than 26 feet and of open construction must carry one B-I, U. S. Coast Guard approved fire extinguisher. 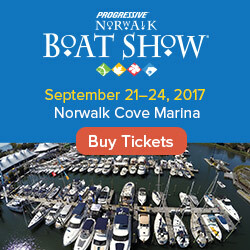 All power boats 26 feet to less than 40 feet must carry two B-I or one B-II U. S. Coast Guard approved fire extinguishers. 40 feet to less than 65 feet must carry three B-I or one B-II and 1 B-I U. S. Coast Guard approved fire extinguishers.